The first time most people see a 12-string guitar, they can tell there is something wrong. Something seems off. It simply doesn't look quite right to the eye. The neck is too wide. The headstock is too long. 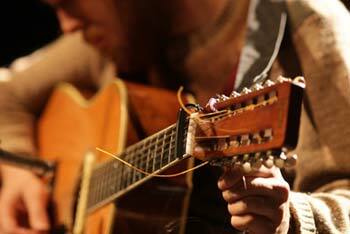 There are too many tuning machines and there are all those strings. That's the problem. There are too many strings. Why are there so many strings? That question is answered the first time you hear a 12-string guitar being played by someone who loves all those strings, the too-fat neck and the giant headstock with too many tuning machines. The sound of a 12-string guitar is magic. People use words such as full, loud, harmonious, beautiful and glorious to describe the sound only a 12-string guitar can make. It has no equal in the world of guitars and as far as anyone knows, no one has built a 14-string guitar yet! The history of the 12-string guitar is shrouded in folklore. There are whispered tales of Italian luthiers working in dimly lit factories in Chicago and New York for companies such as Harmony, Supro and Oscar Schmidt. There are stories of odd-looking guitars coming from Mexico into Texas. This theory is very plausible as Mexican guitars have a long history of instruments with double course strings. One example is the guitarron. There are also theories about harp guitars and lutes being the inspiration for the 12-string guitar. Whilst its origins remain a mystery, the Grunewald Company in New Orleans featured a 12-string guitar in their 1904 catalogue and described it as a new invention. Lyon and Healy were next, in 1905, with a "Mexican Style" 12-string guitar. Many guitar players considered it a novelty instrument and it remained largely obscure until the 1930s. It was in 1927 that bluesman, Blind Willie McTell started playing a 12-string Stella and he is probably most responsible for the instrument's longevity. It seems that from the 1930s onwards, every generation had its share of 12-string guitar players that kept the instrument alive, if not widely popular. The aforementioned Willie McTell dominated the blues in the 1930s. The 1940s gave rise to Huddie "Leadbelly" Ledbetter who carried the 12-string guitar blues into the 1950s. Pete Seeger took up the 12-string guitar in the 1950s and his music caused an explosion of 12-string popularity in the 1960s that carried through to the 1970s. In the 1960s, rock and roll found the 12-string guitar, or perhaps the 12-string guitar found rock and roll. Either way, they made history together. From the start, rock and roll was guitar driven, loud and different. Perhaps the mindset that prevailed was "if six strings is loud and cool, twelve strings is louder and cooler". The list of artists and bands that used 12-string guitars during that era is an impressive one. The Who, The Yardbirds, The Rolling Stones and Bob Dylan are but a few. The Byrds classic "Eight Miles High" heavily features the Rickenbacker electric 12 string. The 12-string guitar shows up on songs such as Led Zeppelin's "Stairway to Heaven", David Bowie's "Space Oddity" and America's "Horse with No Name". Everyone from the Beatles to Jimi Hendrix has quietly (or not so quietly) slipped a 12-string guitar into their music. During this era, the 12-string guitar made its way into every genre of popular music with the exception, perhaps, of disco. But it wouldn't be surprising to find the 12-string guitar there either. This is a tribute to the expressiveness of the instrument and the creativity of those who choose to play it. Since the days of Led Zeppelin, the popularity of 12-string guitars has waned in modern music and is largely restricted to enthusiasts and true virtuosos, like Leo Kottke, who have kept the instrument alive through the 1990s. Is the 12-string guitar relevant to music today? The answer to that question is a resounding yes! The diversity of bands using 12-string guitars is a testament to its relevance. Rock bands that have used 12-string guitars range from Pantera, The Eagles and Aerosmith to Pink Floyd and dozens of others. The 12-string guitar is also a favourite among country, folk and gospel bands. Unbelievably, there are even obscure references to 12-string guitar loops being used in techno and dance music. Oh my! One of the best examples of the modern use of a 12-string guitar is James Hetfield playing one on Metallica's "Nothing Else Matters" which is proof enough that the 12-string guitar is appropriate for any style or genre of music one might think of. Even with its long and complex history, there remains a mystique that surrounds the 12-string guitar. It looks hard to play. All those extra strings can seem overwhelming to the inexperienced player, but in reality, it is played just like a regular guitar. With time and practice, any guitar player can become very competent on a 12-string guitar and it has been said that learning to play one forces you to become a better player. When looking for a 12-string guitar to call your own, sound quality is more important than price, but even for those on a budget the foremost consideration should be comfort. 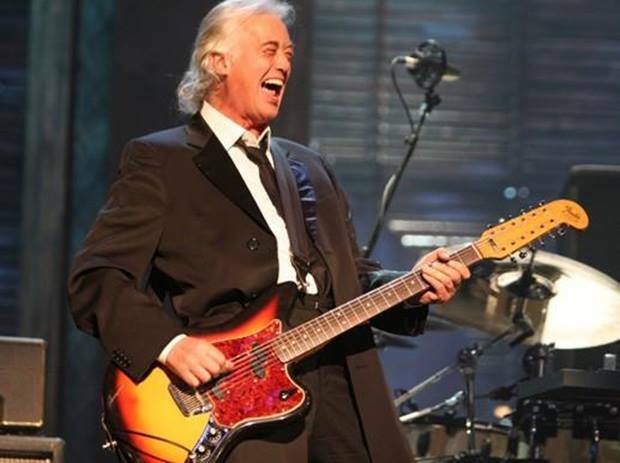 A comfortable guitar is simply more fun to play. The neck should be comfortable in your hands. The strings should not cut your fingers when you press them down. The bottom line is that if the guitar hurts to play it, you will not play it. 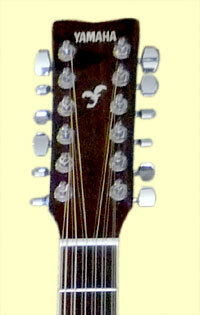 Many companies offer 12-string guitars in many configurations at many different price points. Fender, Gibson, Ovation, Taylor, Yamaha, Guild and several other lesser known companies build 12-string guitars. You can get them in acoustic, acoustic/electric or even full on electric for those with a wild side.Burns even make an electric 12 stringer (they call it a double-six) The "Apache" with a tremolo arm! If you love being creative and want something different, many players strongly recommend the awesome sound of the 12-string guitars that can be found at Dawsons Music . You too could become a part of musical history.